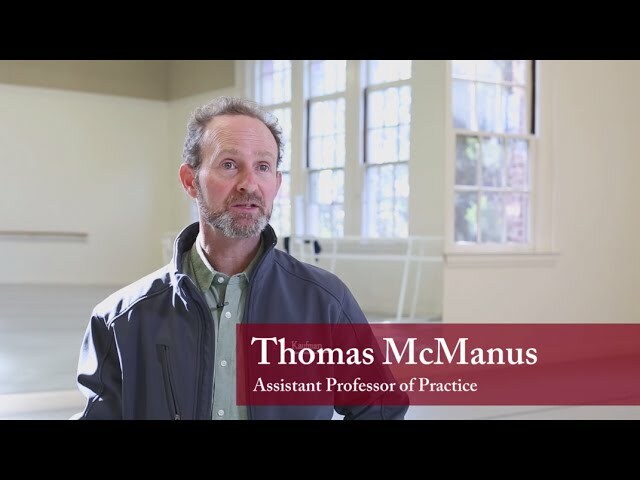 Thomas McManus is professional dancer, choreographer, and educator, as well as a recognized expert on the repertory, technique, and improvisational methods of renowned choreographer William Forsythe. Mr. McManus grew up on the great plains of Illinois before entering the North Carolina School of the Arts, where he began studying dance for the first time at age 16. In 1986, after dancing with American Ballet Theater 2, Finis Jhung’s Chamber Ballet USA, and Ann Marie D’Angelo and Dancers, McManus joined Ballet Frankfurt under the direction of William Forsythe. In the course of the next thirteen years, McManus danced nearly all of the new works created by Forsythe and became entrusted with setting Mr. Forsythe’s repertory on other major companies around the world – work that he has continued since retiring from the company in 1999. In addition to his extensive collaboration with Mr. Forsythe, during the course of his distinguished dance career Mr. McManus has also worked with such accomplished choreographers as Stephen Petronio, Twyla Tharp, Amanda Miller, Mark Haim, Daniel Larrieu, Susan Marshall, Phillip Grosser, Sara Rudner, Jan Farbre, Kathryn Posin, William Soleu, Ohad Naharin, Helgi Tomasson, Gale Katchadurian, Peter Sparling, Ann Marie D Angelo, Saeko Ichino, Saburo Teshigawara, and Paul Selwin Norton, among others. Mr. McManus’s choreographic works have been performed around the world, including the National Opera Mannheim (Germany), Opera Liceo (Barcelona), Folksoperan (Stockholm), and Ballet Company Ulm, to name a few. His most recent work includes Cabaret (2015) for the Oper Heidelberg. Since 1999, Mr. McManus has been a member of the performance group ‘commerce’ which he co-founded with Nik Haffner, and has been teaching improvisation workshops all over Europe. As an educator, he has taught for the Interlochen Arts Academy, Menagerie de Verre in Paris, Kiev State Opera Ballet, Deutsches Institut fur Tanzpadagogik in Berlin, the San Francisco Academy of Dance, the University of Champaign-Urbana, and the English National Ballet School in London. At USC, he will teach ballet, improvisation and composition, and repertory. In addition to his professional dance training, Mr. McManus also holds an MFA in Dance from Hollins University, Roanoke and has studied Pilates and Gyrokinesis. Thomas McManus working with the dancers of the Ulm Ballet, 2007.